Please send this link to a friend. You may post any TENC article on the internet as long as you credit TENC and the author(s). Then, just reply to the confirmation email. Our readers make TENC possible. Please donate! As you probably are not aware, on October 1st NATO began twelve-days of special forces maneuvers on land and in the air and sea, on the Yugoslav side of the Adriatic. Thirteen countries are participating, including twelve NATO members plus Croatia, which is hosting the maneuvers even though it is not a member - a first. Albania and Montenegro, also not members, are observing. Serbia is not. 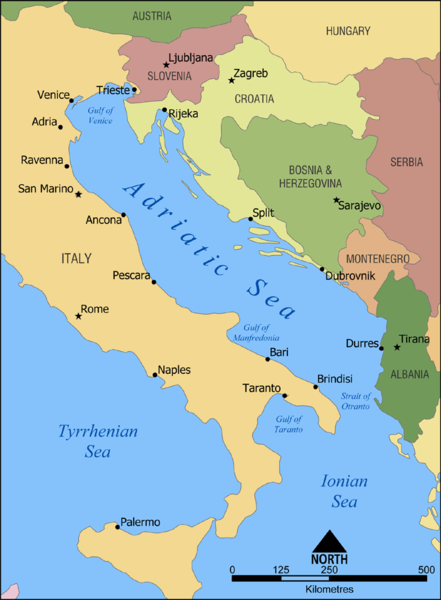 These military maneuvers, positioning Croatia as NATO’s command center in the Adriatic Sea area, with coastal states Albania and Montenegro as deputies (see map), are being held after a year of escalating clerical-fascist activity in Croatia, activity to which NATO, by presenting Croatia as a model Adriatic state, has given its blessing. other-worldliness, is a very powerful – if not the most powerful – single political force in the earthly region of Europe, East and West. If you don’t know about the maneuvers it is because your local media, at least if it is French, English, Italian, German, Spanish or Dutch, has been nearly silent. The BBC Monitoring service has been sending Croatian news agency dispatches on the maneuvers to its many thousands of media customers. (We have set up a page so you can see three of the BBC Monitoring dispatches .) But besides military websites, all we can find as of today (October 10th) are a photo with caption in US News and World Report  and a brief mention in the newspaper La Gazzetta del Mezzogiorno in Puglia, Italy, and on a Puglia TV news program . Other than that, nothing. And yet, the maneuvers are manifestly important. Third of all, NATO is not holding the maneuvers in some neutral location but in the battlegrounds of the war-plagued Balkans: the Dalmatian coast, an area that host-Croatia seized during the 1990s, and a few inland locations. One is the city of Knin , formerly capital of the Krajina Serbian Republic (RSK). Croatia drove the RSK’s entire population of more than 250,000 from their homes into refugee status, or killed them, in 1995. By approving Knin as a location for Croatian-hosted maneuvers, NATO legitimizes this genocide. NATO describes the maneuvers as preparation for “Peace Enforcement”  but they seem more like ‘rubbing salt in a wound’ to me. Which brings us to the fourth point. The media is supposed to draw the public’s attention to important connections between events. Reporters and editors may recall a recent decade of war in the Balkans - clue: it was called ‘the 90s’ - that began with Croatia’s violent 1991 secession from Yugoslavia. They may recall that NATO massively bombed the Bosnian Serbs in the fall of 1995 and Serbia proper in 1999. Why hasn't the media reported that the same Croatia is hosting military maneuvers for the same NATO in the identical Balkans, pointing out the most obvious connection, that this is either preparation for war or a provocation that could lead to war. Ah. “Peace enforcement” in a “ficticitous country” in the Adriatic region “on the brink of civil war.” Let’s consider this. First, there is no way to ‘enforce peace’ in a country supposedly on the verge of civil war without boosting some forces and hurting (or crushing) others. And indeed, no power would get involved in such a quagmire unless it was allied with - or sponsoring - one side. Second, even if there is no real “brink,” big powers can always manufacture the appearance of one using false media reports and/or incidents staged by local proxies, of which the NATO countries have plenty in the Adriatic region. And third, if NATO were really worried about avoiding civil strife, why provoke it by showcasing Croatia, Albania and Montenegro, which are governed by forces that promote anti-Serb racism, celebrate the breakup of Yugoslavia and advocate further attacks on the Serbs and consolidation of the breakup? So, spitting in the face of the Italian judiciary, NATO has invited a government accused of mafia-linked, Adriatic smuggling to observe Adriatic military maneuvers. Why? So that the Montenegrin leaders can learn new tricks about evading capture? Or perhaps they will patrol the coast? Politically, Montenegro is sharply divided; its government would like to suppress the large part of the population that wishes to return to close relations with Serbia and believes in Yugoslav unity. By inviting Montenegro and Albania to maneuvers hosted by Croatia, NATO is in effect assembling a NATO-backed local alliance under Croatian leadership against Serbia and in control of the coast. In the ’90s, when NATO intervened to support - and sponsor - military action against Serbia and the Bosnian and Krajina Serb states, NATO justified it on the grounds that they were just trying to preserve the peace in the face of supposedly power-hungry, expansionist Serbian leaders. To gauge the credibility of that claim, consider that in holding the current, provocatively anti-Serb maneuvers, NATO is likewise claiming they are intended to preserve the peace. Consider that today most of the top leaders of the Bosnian Serbs, and of their Bosnian Muslim and Krajina Serb allies, are dead, in jail or in hiding. 500,000 or more Serbs have been driven from Croatia and adjacent areas. Serbia’s former ally, Montenegro, has split away from Serbia and is run by Serb-baiters. Republika Srpska is part of a Bosnian ‘state,’ which it shares with the same Muslim-Croat federation the Serbs and their Muslim allies once fought, a state dictatorially controlled by the NATO powers. In Serbia itself, Milosevic is dead. The top political parties (both in power and in the opposition) passively supported or participated in the NATO-directed coup of March 2000. While the charge that under Milosevic Serbia was a violently expansionist state was always a lie - Milosevic was in fact an appeaser, although he fooled many people, including me, with his rhetoric, and as for the Bosnian and Krajina Serb Republics, they always had defensive strategies - the charge that Serbia is an aggressive threat today is simply preposterous. B) For nearly a hundred years the Serbs have resisted German and Vatican attempts to keep the Balkans divided into tiny states, have resisted the fomenting of divide-and-conquer racism and religious fanaticism and, starting in the 1930s, resisted the fusion of racism and religious fanaticism known as ‘clerical-fascism.’ That is a major reason why, in the first half of the twentieth century (that is, until the end of World War II) and starting again in the 1980s and 1990s, Germany and the Vatican made crushing the Serbs and other pro-Yugoslav forces (e.g., in the 1990s, the Bosnian Muslims under Fikret Abdic ) their practical goal in the Balkans. Since Germany and the Vatican are the US establishment’s primary allies in Europe, this anti-Serbian goal became US policy as well. Became, and still is. Because even today, after all that has happened, the Serbs remain a substantial presence in the Balkans, and are not politically broken. Most have been driven from their homes in Kosovo and the Krajina, but large Serbian populations remain in Bosnia and of course Serbia. The bombed, terrorized, whittled down and betrayed ‘entity’ that is the remains of Republika Srpska (in Bosnia) still holds government-authorized conferences defending the truth about the Jasenovac death camp complex, speaking the unspeakable, that is, linking the Holocaust to German and Vatican policies past and present. The Serbs' stubborn adherence to principle is a large part of the reason why the German leadership did not stop the attempt by the Croatian Ustasha fascists, from 1941 to 1945, to eliminate the Serbs, even though the Ustashe’s unspeakably brutal mass murder drove tens of thousands of Serbs to join the Partisans and the Cetnik guerrillas, and therefore was, from a purely military point of view, a big problem for Germany. And it is a large part of the reason why NATO is holding these maneuvers today. Because the Serbs, not some government or political party, but the Serbs as a people, pose, by their very existence as a political force, the possibility of Slavic unity against Germany and the Vatican and other predators in the Balkans. However, there is more involved in the attack on the Serbs and others who uphold Yugoslavia. It is not simply a practical measure, instigated by Germany and the Roman Catholic church, to crush those who embody the threat of creating Yugoslav unity and who oppose racism. It is a means to a more ambitious end. What end do they have in mind? To help us understand that question we will need to examine what has been happening in recent times - we will focus on the past twelve months - in Croatia. When institutions have been around a long time, people begin to think of them as inevitable parts of the social landscape. But there is nothing inevitable about NATO, a military machine created by allies in a clear-cut conflict: the cold war. The cold war is over, so why does NATO still exist? Why is it expanding? Alliances are formed to a purpose. What is the goal of this one now that there is no Soviet bloc? To achieve security? How has the destruction of Yugoslavia increased security? How do the current maneuvers, not just showcasing the Serbs’ regional enemies but including in the itinerary the city of Knin, site of a terrible tragedy for the Serbian people - how can this possibly increase security? Surely ‘security’ is a euphemism, but for what? By choosing to break precedent to allow Croatia to host these maneuvers; by holding them in prime criminal locations of Croatia’s 1990s “Homeland war”; and by giving Croatia the appearance of guarantor of Adriatic security - NATO has boosted Croatia’s world standing and its ability to politically influence and menace others in the Adriatic in pursuit of what Croatia wants. Therefore, if we examine what the dominant forces in and around NATO have been molding Croatia to want, it may help us understand what these forces are trying to secure and how they plan to secure it, especially as regards the countries that resisted Germany and the Vatican in the past - the countries that formed the now-defunct Socialist bloc and/or those that have a tradition of massive democratic and/or anti-fascist movements, such as Yugoslavia and Italy. Let's look at what has been happening in Croatia. Support Emperor's Clothes with a much-needed donation! “Marina Militare,” see footnote , above. Emperor’s Clothes Needs Your Donation! Our work depends on donations. If you find Emperor's Clothes useful, please help us to pay website, research and technical expenses. Every donation helps, big or small. If you would like to donate but can't afford to now, you can help by posting Emperor's Clothes articles on websites and discussion lists, and distributing them by email. If you can afford to donate now, please do.